IT"S FALL!!! To prepare for the colder months that we (hopefully) have ahead of us, I have been making the sweetest fully lined jackets for Hannah. I love how baby projects can use up the tiniest scraps of fabric. I find it so satisfying to rifle through my scrap bins, come out with a handful of random fabrics, and fit them all together for such a unique look. For today's post, I will be reviewing the newest released pattern by Honeydew Kisses, the Dewdrop Sweatshirt, talking about how I get a well-placed zipper on a knit garment, and giving you resources to make your own. The Dewdrop Sweatshirt is a zip-up jacket that is fully lined and can be reversible. The pattern requires an open bottom, separating jacket zipper, and if you use a reversible one, you can have a reversible jacket. The pattern comes in sizes 6-12 months up to size 14, which covers chest sizes 18.5 to 31.5. The jacket is constructed so that no seams show on the inside. You turn the jacket to the correct side at the end and then stitch the hole on the back of the waistband where you pulled it through when you topstitch the waistband. If you don't want to spend too much time with your seam ripper, follow through each step and don't get ahead of yourself! The pattern has the option for a 3 piece hood or a collar. It also has an optional ruffle that goes around the chest and the back of the jacket. I love the fit of this jacket on her. It has plenty of ease to wear a long sleeved shirt underneath, but is not so bulky that it looks odd on her. You will want to use a stretchy knit so that it fits well (and for longer than a month!) I also love that the hood does not come close to her mouth. It hits at a perfect place underneath her chin. For this jacket, I used all cotton lycra for the outside. The inside of her jacket is a super soft cotton velour. It is so soft and makes the jacket feel cushy and squishy. I made Hannah a pair of cotton velour joggers to go with her jacket. The cotton velour joggers are the Juniper Joggers from Striped Swallow. They are my absolute favorite joggers pattern for a cloth diapered bum. They have the perfect amount of ease. I made her several pairs when I was pregnant in the 0-3 size, and they fit all the way from birth to 7 months over a cloth diaper!! When they did not fit anymore, it was the summer so the timing worked out perfect. Now that we are entering into cooler months again, I am sewing her some in the 12 month size. For my next Dewdrop Sweatshirt, I used French terry for the outer fabric and cotton lycra for the lining and bands. This is a rayon/poly/spandex blend French terry that is a lighter weight. I tried out a new pattern for her pants. It is the FREE harem pants by Sofilantjes. This pattern is available in the files of their Facebook group and only goes up to size 12 months. I made the 12 month size in brushed poly, and they have plenty of ease for a cloth diaper. They are actually several inches too long (hence the bunching in the legs) so I know we will not be outgrowing these before next summer. I previously was so intimidated by sewing zippers on knits. I hated it when they were wavy after I spent so much time pinning and going slow to try to get it perfect. I found that to get a well placed zipper on knits, you have to use interfacing. I use a woven featherweight or lightweight interfacing like I use when making bags because I do not want that area to stretch. The biggest factor I think for me with zippers is that I also only sew with the zipper tape side facing my presser foot. So, if this means I have to sew from the opposite direction, so be it. My machine has a built in walking foot to feed the layers evenly, but I have to disengage the walking foot when I put on my zipper foot. If I sew with the zipper tape side facing up, then I don't have to worry about my presser foot stretching out the knit fabric. On this pattern, Talia (the designer) gives excellent instructions for how to get the zipper to line up and how to shorten a zipper if you need to buy one that is too long. I keep lots of long zippers on hand so that I am ready for testing projects so I always need to trim them down. 1. The Dewdrop Sweatshirt pdf pattern is available to purchase here. 2. You can join this Facebook group (Sofilantjes Patterns Sew and Show) to find the free harems pattern from Sofilantjes in the groups' files. 3. The Striped Swallow Juniper Joggers pattern is $6 for the baby sizes or $6 for the kids sizes. You can buy a bundle including both the babies and kids sizes for $10 here. 4. All cotton lycra fabric in this post came from Made Whimsy Fabric. (except the black/white stars) You can find the scales here and the win or lose on her back and cuffs here. I got the stars on a destash, so I am not sure where they came from. 5. The cotton velour came from Made Whimsy Fabric and can be found here. 6. The French Terry came from So Sew English. 7. The Kale colored brushed polyester fabric for her Harem pants came from the Fabric Fairy and can be found here. It was a scrap from my Greenstyle Pacific Pullover that I blogged about here. 8. The zippers came from Zipper Stop on Etsy and can be found here. I bought the black and baby pink. I love all the fun photos I got of Hannah in this session! 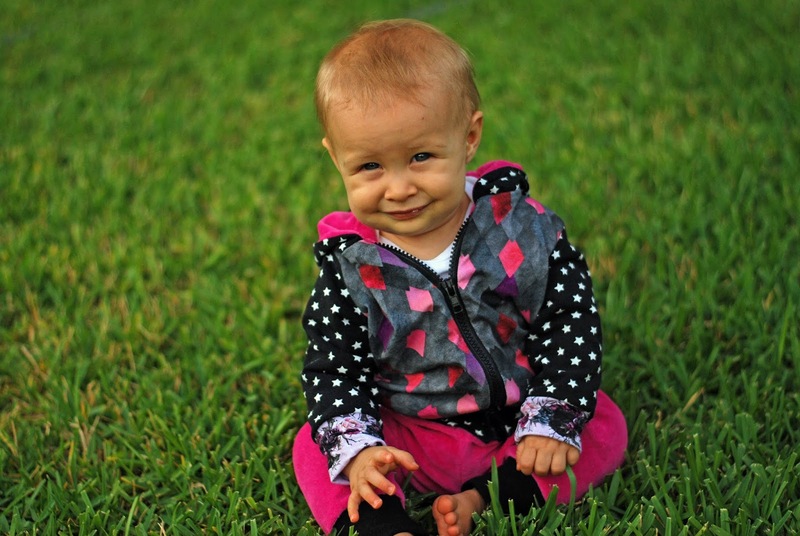 She makes the funniest faces!! She was quite funny for her photos and was so excited that mom let her crawl around in the grass. She also got her FIRST tooth!